Banks are unique. We treat them that way. This includes years of publicly available information gleaned from Call Reports, the results of quarterly stress tests run on every community bank in the U.S. since 2009, deposits by branch, M&A deal information, economic data, peer performance information, stock prices and more. We also have an ever-growing database of loan level information. Banking P&L is dictated by the balance sheet. That requires an in-depth focus on a bank’s basic building blocks to understand the institution, its risks and rewards. Using both public and private data, we break down banks to their core, allowing us to deliver forward-looking reports on capital adequacy, loan vintages, M&A targeting, CECL readiness and strategic planning. 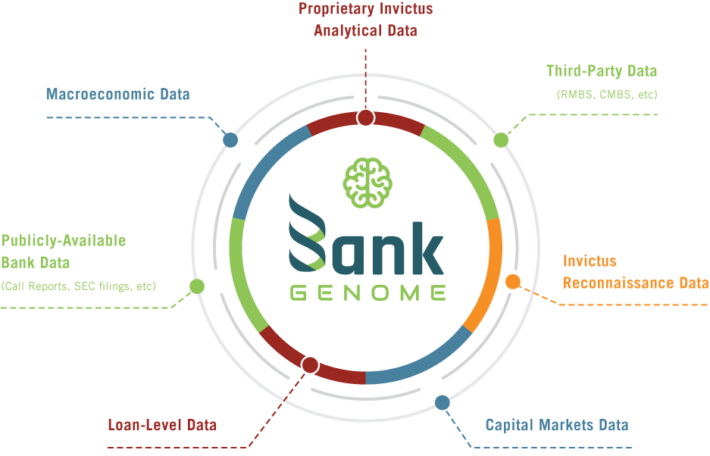 The key is BankGenome, our exclusive database and Bank Intelligence system and analytical process. Invictus has redefined bank analysis. Unlike most consultants and investment banks, we do not rely on pro forma analyses driven by historical bank statements to derive insights into the future. That methodology was roundly discredited after the financial crisis of 2008. Rather than wait for regulators and accountants to come up with a new methodology, Invictus created its own.